The Exhibiting and Advertising Guide is Here! Click image to print or download. Meeting associates face-to-face is the fastest and most effective way to build relationships, and interact with decision makers and potential customers. Symposium attendees consistently tell us how much they learn from and enjoy their time in the exhibit area and discover products and services they were not aware of before. 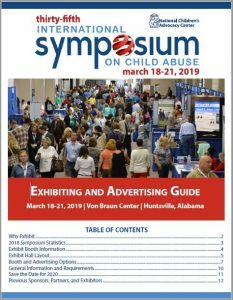 Your presence at the Symposium positions your organization as a committed supporter in the fight to end child abuse and gives you a competitive advantage in the industry. 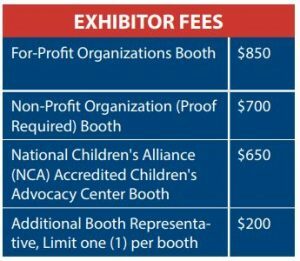 Make the most of your marketing dollars by taking advantage of this affordable exhibit opportunity! For questions, please fill out our Contact Us page. Up your visibility, connect with potential customers, and maintain a strong presence in your market! BACA (Bikers Against Child Abuse) International, Inc.
Cookie Lee Jewelry - Accessories Too! Little Bit of Love Design Co.
Second Opinion Telemedicine Solutions, Inc.